During this year’s Nutrition and Growth conference, which takes place in Valencia, Spain, from March 7-9 2019, Nutricia will be present in many different ways. Friday, March 8, 12:00 – 13:30 hrs, Nutricia will host a Satellite Symposium on the subject of ‘Nutrition for infants with specific needs translating latest science insights into practice’. • Nutrtional needs of preterm infants – in hospital and after discharge. • Why care about nutrition and eating habits in early life? Impact on growth and development. 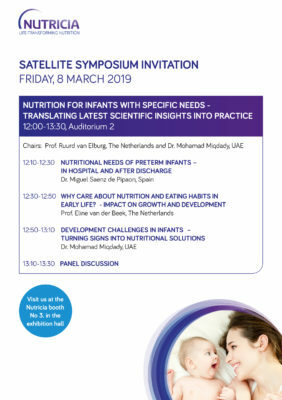 Chairs of the Symposium are Dr. Mohamad Miqdady, UAE and Prof. Ruurd van Elburg from Danone Nutricia Research. Click to see our Invitation Satellite Symposium. Throughout the conference, 7 Danone Nutricia Research abstracts will be presented as either oral or poster presentations. Click here to discover more about the conference. Please come and visit us in Auditorium 2 for our Satellite Symposium and at booth No. 3 in the exhibition area and learn more about our science and nutritional solutions for those with special nutritional needs. This 6th edition of N&G will take place March 7-9, 2019 in Valencia, Spain. The N&G conference aims to bring together paediatricians, nutritionists, neonatologists, experts in child development and other specialists to discuss the challenges of the interplay between nutrition and growth in the paediatric age group. The meeting enables the exchange of ideas and knowledge between different disciplines facilitating research and clinical interdisciplinary collaborations focusing on nutrition and growth.